Here you can find all the Molasses Creek news from on and off Ocracoke Island, NC. A quick note to let you know that that we are having a Molasses Creek 4 Cd giveaway. The drawing will be February 28th. To enter, visit http://www.ocracokeweb.com/Music_Giveaway_.html and follow the instructions! Thanks! The holiday season is over and Molasses Creek had a great set of concerts at First Night Williamsburg, VA. A fan club accompanied the group, including Philip Howard and Lou Ann Homan of Ocracoke, Pat and Steve Tweedie from Oklahoma, Amy & Lachlan Howard (with Fiddler Dave), Ann Tweedie & Stephen Meyer along with kids Finn & Ripley (all the way from Scotland! ), and Beth Hampton (joining Gerald). Although the evening of December 31, was a chilly one, the following two days were balmy for winter and perfect for strolling about the historic grounds of Colonial Williamsburg. Young Lachlan was keen on visiting the Ripley's Believe it Or Not Museum in town, and Fiddler Dave and Amy humored his desire to have his wits scared out of him by shrunken heads, giants, and holographic ghosts. He clung to their legs for the rest of the trip. Marcy and Lou had flown in from Ireland, where they spent December holed up in a cottage near Cork. Neither the beach house that they stayed in, nor the travelers themselves were quite expecting the snows that accompanied the visit! 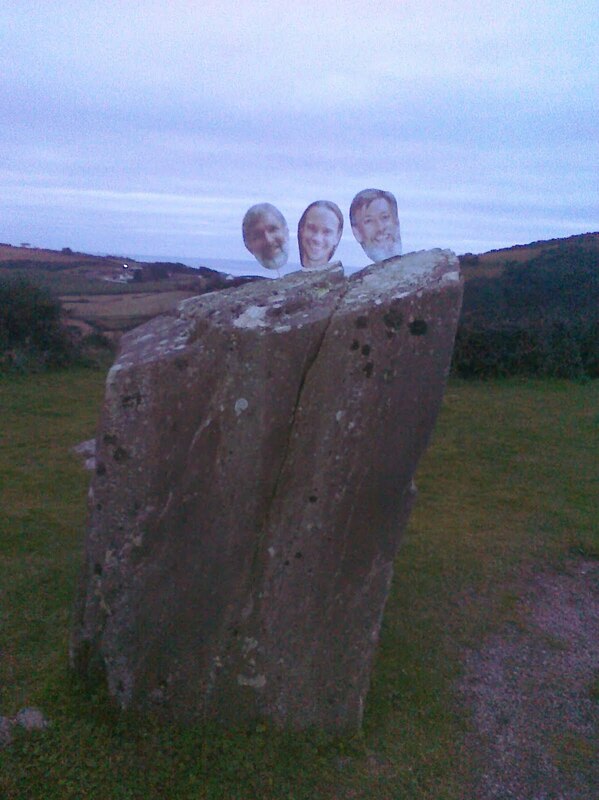 Although Gary, Fiddler Dave and Gerald didn't realize it, they also made the tour to the Emerald Island, catching a band photo opportunity in front of the Heron Shop in Ahakista, and perched atop ancient stones at the Drombeg Stone Circle. Now safely back on Ocracoke, Gary, Marcy, Lou, and Fiddler Dave have begun working on a new Molasses Creek album. The production is top secret, of course, but will feature some brand new original songs by the crew. You might remember that Molasses Creek spent a couple of days back in November filming performances in Wilmington, NC. They are now getting some sneak peaks at filmmaker Mark Teachey's fine work. To see some of the footage for "That's What I Like About You" visit http://www.vimeo.com/18828806. At our next blog update, we will include more links for you folks to share with all of your friends. This week on Ocracoke Island, friends Michael Hilton and Jim Buck have been working on some much needed renovations at Molasses Creek's Deepwater Theater. Yoga instructor, Amy Hilton, persuaded Fiddler Dave that the new gas heater and climate controlled room would help the wintertime yoga students to keep from freezing up during Downward Dog. Work was completed today to cheers from many stretchers. The newly insulated walls will also help keep the Deepwater cooler for the summertime visitors as well! Hooray! This next weekend Molasses Creek travels to the middle of North Carolina for a sold out Friday night concert at the Little Lake House Concert is Raleigh, and then on to a Saturday night private concert celebrating the 15-year anniversary of Goat Lady Dairy, near Asheboro, NC. 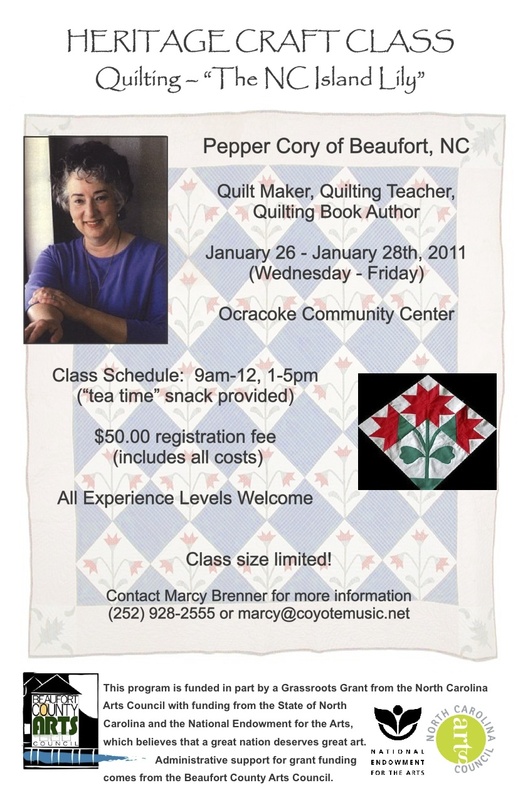 Also coming up quick in January, the Ocracoke Arts Council in partnership with the Beaufort County Arts Council, the NC Arts Council, the NEA, and the Ocrafolk Festival is helping to produce a Heritage Craft Class on "Quilting the NC Island Lily." Nationally renown quilter, Pepper Cory, of Beaufort, NC will be teaching the class January 26-28 at the Ocracoke Community Center. (Molasses Creek ran in to Pepper's husband when they opened for Rhonda Vincent and the Rage in Morehead City last year). For more information on the course, please contact Marcy Brenner at 252-928-2555 or info@coyotemusic.net. The class is being offered for a $50 registration fee. On January 28, the Ocrafolk Festival Winter Concert Series will bring the baroque group Basso to Ocracoke Island for a concert at Deepwater Theater and appearances at the Ocracoke School. Basso was formed by friends Barbara Blaker Krumdieck and Robbie Link, to explore the music of the baroque era featuring bass instruments. Basso changes personnel depending on the instrumentation chosen for each set of concerts. This performance will include Barbara Blaker Krumdieck- baroque cello, Robbie Link- viola da gamba, baroque cello and violone (baroque upright bass), joined by William Simms of Baltimore- baroque guitar- and theorbo and Sally Blaker of California (Barbara’s Mom! 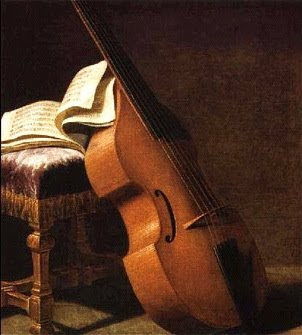 )- baroque cello- playing works by Vitali, Platti and Vivaldi. We can't wait! On the weekend of February 12, Soundside artist, John Golden, will travel to Ocracoke from Wilmington, NC for a wintertime sockhop. John has been working on an album with Martin Garrish, and the live performance/dance will feature many of the new songs from the recording. A dance is a great way to keep warm during the blustery winter months! February 16-20, Molasses Creek will travel to Memphis, TN for the annual International Folk Alliance conference. The conference is a wonderful opportunity to exchange music, discover new and old talent, and promote the band to the folk music community. 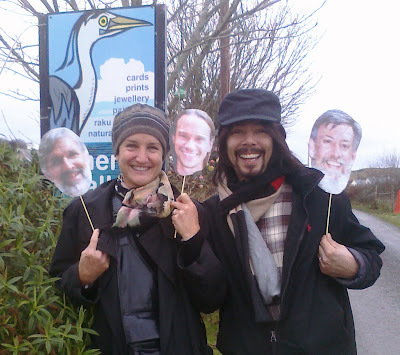 In addition to Molasses Creek doing some showcasing (and hopefully booking a lot of engagements) the crew plans to do some visiting with friends Ernest and Joan Kelly, wonderful dancers who travel to the Ocrafolk Festival each year. Ernest and Joah always inspire everyone with their elegant moves and crafty dance calls. Those of you who picked up the latest Molasses Creek album may recognize their name in association with Fiddler Dave's "Selchie's Joy Waltz." The waltz was named by Ernest and Joan for a special Ocracoke anniversary. Come to Ocracoke Island and Become a Recording Star! A lot of you may not be aware that Gary Mitchell (of Molasses Creek) operates a professional recording studio here on the island. The great majority of Molasses Creek, Ocrafolk Music Sampler, and other Soundside Records artists have been, and continue to be recorded, produced and mastered right here at Soundside Studio. Gary and his studio are available for a reasonable hourly fee to anyone interested in recording a high quality demo or full CD project. He has recorded everything from solo guitar and piano projects to full bands, and many of Ocracoke’s finest musicians are available for session work. Maybe you’ve written a song you’d like to demo, or have some songs you’d like to record just for your family, or would like help producing your first professional CD project. Give Gary a call at 252-928-4280 or email him at studio@soundsiderecords.com to discuss the possibilities. Read more about the studio at www.soundsiderecords.com/studio.html. In March and April, Molasses Creek will be on the road for about a month, traveling to the hopefully not-so-frozen north for a spring tour. Here is the list of places they currently have engagements. Feel free to contact Fiddler Dave at info@molassescreek.com if you see a date opening and are along the route. They would love to add more concerts to the trip! More details will be added later! Hope all is going well for you folks this new year! Bluehost is ultimately one of the best hosting provider with plans for any hosting requirments.